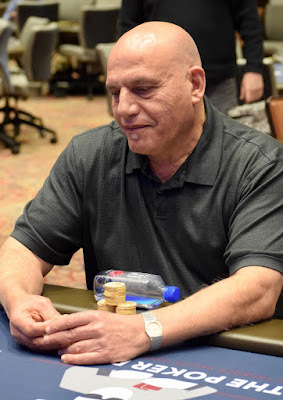 All in preflop with Ace_Deuce, George Saca (above) runs in the the BB Pocket_Jacks of Pat Lyons. No Ace comes on the flop, turn or river and Saca is eliminated in 12th place, cashing for $22,706. Five more eliminations and tomorrow's LiveStream @WPT Rolling Thunder Main Event final table is set. Lyons moves to 2 million chips.